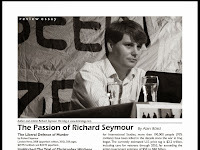 "Only 36 years old, still a graduate student at the London School of Economics, and best-known since 2003 for the popular blog “Lenin’s Tomb” (www.leninology.com), Seymour is particularly armed and dangerous when it comes to the subject of those political activists who ostentatiously migrated from Marxism to the cause of Liberal Interventionism (more accurately, Liberal Imperialism) just before and after 9/11. In The Liberal Defence of Murder he embeds them (Christopher Hitchens, Paul Berman, Kanan Makiya, Bernard-Henry Lévy, and many more of this mostly male phenomenon) in a long tradition of intellectuals who formulate humanitarian reasons for backing empire. His book is a polemic, based primarily on secondary readings, and makes no pretense of providing a balanced, well-rounded view of historical situations. Yet the cogency and sophistication of his achievement as an overall perspective should not be underemphasized. In conception, steely scholarship and piercing insights, it is a Marxist masterpiece of this particular genre. With elegant asperity and mordant antipathy, Seymour undresses the unsavory record of the liberal apologists for empire in a sane and steady voice that will enrage many and enlighten more. He combines an electrifying and formidable historical study with close readings and incisive analysis, not to mention a brilliant eye for the horrible detail of hypocritical posturing. In four trenchant and learned chapters, preceded and followed by a Prologue and Conclusion in coruscating prose, Seymour expertly traces the regularity with which liberal moralizing has been joined at the hip with bloody conquest. Beginning with the 17th century subjugation of Ireland, liberal ideas established the currently-deployed terms of discourse, such as “civilization” and “progress,” to disguise genocide, slavery and occupation. Using great erudition, rich prose and a rare ability to integrate sophisticated historical and sociological analysis, Seymour shows how Enlightenment liberals, victims of their own political fantasies at best, replaced an originally skeptical attitude toward empire with “an almost uniform support for the colonial enterprise” especially targeting those “who advocated the extension of self-government domestically” (27)." I say. Can't complain about that.